By margreet, June 29, 2017 at 12:25 pm . After three months of working on publishing a manuscript, I understood that today in the Digital Age, publishing is not reserved to traditional publishing houses anymore but, to the opposite, it can be achieved by anybody, with a few digital tools, a carefully curated workflow, and only small experience in coding required. In the first half of our internship, Bella and I were each assigned to a book of the Theory on Demand series that we had to turn into a print edition and an e-book. Having had little to no experience in this before, it posed quite a great challenge to us but in the end, we managed it successfully. The world of self-publishing was introduced to us by the Hybrid Publishing Toolkit, which you can access here. The Hybrid Publishing Toolkit is especially addressing people that have no resources for high-scale publishing but have only a low-budget and are interested in publishing small editions. It points out to helpful tools and workflows that help along the process. Key element to the workflow is the Markup Language, which facilitates giving structural meaning to the initial manuscript. In this example, we have been working with Markdown, which is a type of language within Markup. The other main components were the programme Pandoc, which is used for file conversion, and a Makefile, that has already been coded for other books belonging to the series. For using Pandoc and the Makefile, you will also need to work a lot with the console, which for me – being a user of Windows – stated some problems. In opposite to Mac, Windows is not based on Linux, which makes the whole process a bit more difficult. To work around this, I needed to install a Unix shell (I decided for “Bash on Ubuntu on Linux”) which allowed me to use the Linux environment on my computer. The whole process started by editing the original word document. We assigned every header, paragraph, footnote and blockquote using the Style Pane of Word. The next step was to use the console. Within the console we needed to access the folder structure that we could download from our project in GitHub, a development platform we use for collaboration. These folders included for instance the Makefile, that helps us execute Pandoc, and the preconfigured stylesheets for the Theory on Demand series. By use of the Makefile and Pandoc, we converted the .docx file into a markdown-file. This markdown-file allowed us to represent the text as simple as possible while still maintaining its structural elements. The markdown file served as a source for the following steps where we would further convert it into firstly an .epub file for the e-book edition as well as into an .icml file, which we would later implement into a preconfigured InDesign file. The epub that we generated was, thanks to the stylesheet, already almost final. After correcting some minor things such as colours or pictures, our first product was therefore quickly done. The creation of the InDesign files, however, took a bit more expertise and time. 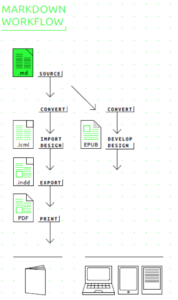 We made use of the InDesign file of our project folder and for each chapter created a new document where we would load into the according .icml file that included the text and its internal structure. The InDesign file already included a style sheet that, normally, should have recognized the text’s structure right away. Nevertheless, this stated some problems since the automatic recognition did not always work smoothly and some fonts still needed to be installed. However, after working a couple of days on this, we could finally export the InDesign-files into .pdf and send them to our Print on Demand provider, to have the long-awaited printed copy. This included also taking care of the cover and making sure that it has the expected measurements for the printer to cut. All in all, after two and a half months of editing, converting, nerve-losing, and finally happy-being, our final products were there and we are more than proud to have done this (almost) by ourselves. If you are interested in the final outcome, you can find the books here: +KAOS. Ten Years of Hacking and Media Activism and Culture of the Selfie: Self-Representation in Contemporary Visual Culture.